The requirements to complete the “Insane in the Membrane” achievement. I want to say something about the kinds of motivations people have for playing World of Warcraft. Specifically, I want to enumerate factors that motivate players to persist in the game even when it involves tasks that are repetitive, boring, or seemingly impossibly long. 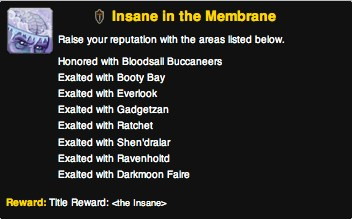 For example, there’s an achievement in World of Warcraft called “Insane in the Membrane” that gives the completer a reward of an in-game title of “The Insane.” This achievement requires you to raise your reputation points with different game factions to exalted, the highest level. Generally, you need about 21,000 points to reach exalted. Points are gained by completing quests, collecting and turning in items, or sometimes killing certain types of things. If you only had to gain exalted reputation with one or two factions, this would not be difficult. However, you need to do this with eight different factions, most of which are not factions you would be accruing large amounts of reputation with during the normal course of play. To increase the difficulty, several of the factions involved have rival factions. With those factions, as you gain reputation with one, you lose reputation points with the rival faction, making the process of completing this achievement complex in addition to time-consuming. The WoWWiki (2009) page describes some strategies for completing this achievement and the complexities of the faction-rival relationships. Most tasks players undertake are not going to be as complex, time-consuming, or mind-numbing to complete as the aptly-named “Insane in the Membrane”. There are, however, many smaller day-to-day activities necessary for successful raiding or to get some particular piece of gear, such as doing daily quests to earn gold, or harvesting materials for potions or enchantments, or completing instance and after instance to get badge rewards or reputation rewards. I’m making it sound like getting achievements or gear is the be-all, end-all, but I think the situation is more complex than that. It’s that hypothesis I want to verify. What motivates people to persist in very boring or difficult tasks? Is there a relationship between gender and stated motivations? If so, what is it? Is there a relationship between age and stated motivations? If so, what is it? Is there a relationship between nationality and stated motivations? If so, what is it? With those six questions in mind and the original study idea of determining motivation via analysis of free-form essays about motivation, I can now go ahead and develop the specific survey questions that will help elicit data to answer those questions. Going back to considering my approach-whether I should start with planning versus start with survey question-it was not as clearcut as I expected. By starting with some potential survey questions and then thinking about the answers I would get from them, I gained a better idea about what answers I wanted, a kind of iterative development process. Sometimes putting the horse first helps you know where and how to put the cart! WoWWiki. (2009) Insane in the Membrane, [online] WoWWiki. Available from http://www.wowwiki.com/Insane_in_The_Membrane (Accessed November 6, 2009). Wondering if you want to find out what de-motivates players too? Or perhaps stops them from playing? Thinking of my own gaming when I was very active in guild was motivated to play lots for the interaction with other players. We were levelling together, doing dungeons and quests together it was very motivating and I was regular player. Then I moved house, job and all that entailed. I was out of circulation for some time and now the motivation to play that character is somewhat less, because have slipped behind those colleagues, they’ve moved on in quests etc so I haven’t got the momentum to play as much. Ultimately, I'm interested in trying to transfer motivational ideas into online education. I know The Open University already does quite a bit of research into why students don't complete courses. The situation you describe where you move house and jobs and just don't have time for an extended period of time is not uncommon. When I've asked Open University students why they've stopped, it's usually due to lack of time. I know some people have to stop playing World of Warcraft because of similar issues, although that's often tied into more negative issues like addiction (which somehow doesn't seem to happen as much in e-learning!). I think it's a worthwhile question to explore in more detail, though. Perhaps as a follow-up study once I have the methodology done if nobody's already looked at it.